Charming, funny and a bit frightening! This is all the things this little book has in abundance! I had no idea what to expect with it, I honestly just picked it up in a charity shop to make it to the four for a pound deal. I thought that maybe it would be quite dark, that terrible things might happen in it, a bit like the boy in the striped pyjamas. But, I was pleasantly surprised! From the POV of a ten year old Anna, who is of Jewish descent living in Germany, with a dad who writes and publishes articles on the news, the family of four is forced to flee from their home before the Nazi’s take away their passports! I was always worried that something bad was going to happen, and some times, little Anna built it up, and it just turned out to be something silly. Something children worried about, which I guess is quite adorable! It’s a lovely little refreshing read, and Judith Kerr paints the picture perfectly! The only qualms I had was that there were so many names, I just had no idea who they were talking about half the time, and as I see it more as a children’s book than an adult read (although, I definitely recommend it to the adults of the world), I think it would be quite hard for a child to keep up with it all! From some further research, I’ve found that this little book is actually semi-autobiographical, and Judith Kerr was the little Anna that fled her home from Berlin via Switzerland to escape to Paris and later England because her father was wanted by the Nazi’s! The title comes from Anna having to decide which toy she wants to take on her journey, and she chooses a little woolly dog and leaves behind pink rabbit because she believes they’ll come back. 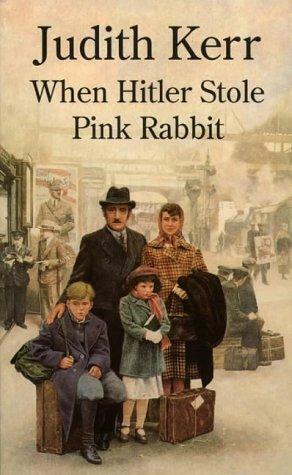 This is followed by the Nazi’s repossessing their house, and all of what they owe, and thus making Anna believe that Hitler stole pink rabbit. All-in-all, it’s a beautiful book, and not something I would usually read, but the smallness of it helped draw me in, and I will definitely be looking out for the other two books in her Out of the Hitler Time Series! One Of Us Is Lying is the mystery YA/Coming-of-age debut novel by the author Karen. M. McManus, and was June’s featured read in the Bookboxclub! (Find the unboxings here). It also made the New York Bestsellers list on the 28th June! Following the Bayview four, during detention – Simon, Bayviews school gossip – is murdered; and a jock, a geek, a princess and the schools resident bad boy are all under suspicion, but which one of them are lying? All of them have secrets, secrets that could ‘ruin’ their lives, secrets that should have died along with Simon, but they haven’t. A mystery thriller with all the suspense added, One Of Us Is Lying is both original and creative, and a different take on your usual who-done-it scenarios. It just grips you – even if you figure out the killer early – until the very end – easily a one-sitting book (if you don’t have to go to work that is). I’ve not read many, if any crime/mystery novels, but I do enjoy TV shows like Lethal Weapon, Death in Paradise, Person of Interest, Sherlock Holmes and all the other sorts, so I’m quite good at putting things together, and if you’re clever enough, you will figure it out, but this book is more than just a mystery novel! I really got a 13 Reasons Why vibe from it whilst reading it – a book I still have mixed feelings on – I don’t know why, but I think if you liked that book, you’ll really enjoy this one. Karen managed to make the characters feel so real, so fleshed out, and so hindered by every day life, and worried about small things that shouldn’t really matter, but I feel like it just made it that more authentic. There are some problems with it, but it’s too spoilery to explain, and there not problems, more like ‘negative views’ on certain things, but when your reading this, you just have to remember that kids nowadays are absolutely terrified of being ridiculed, of being different and teenagers and kids can be so much more worse than adults, it may not be the best to publicize, but it’s what really happens! It’s relateable, even if the whole thing does sound very cliche at first! Overall, it changed my mind on crime novels, and I think I won’t be adversed to adding some to my tbr pyle! Karen. M. McManus is surely going to be full of great things and I can’t wait to be there for her next book, which is a YA thriller, hopefully coming out in 2018!